Although this 45 came out on no less than three labels, sadly these New York recordings never did anything in a crowded marketplace. “I Feel Better” is a bouncy beater which has some dance floor plays, but my interst is in the other side. Where Do We Go From Here is a big city ballad of great power and with a fine melody. 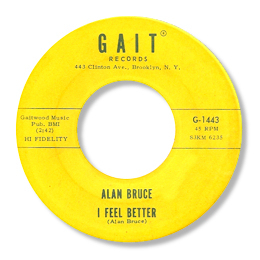 Lots of good things going on behind Bruce’s expressive vocal like the baritone sax which forms a great bottom end for the track, some fine guitar fills (Eric Gale to my ears) and a tasteful male chorus. 1. The date for these tracks is often given as 1962 but there is no way that’s correct. They are mid 60s for sure. The Gait was the first issue of this one, but interesting to note that by the time it came out on Garrison that odious individual Huey Meaux managed to get his name on the disc as co-producer. 2. Davie Gordon has supplied better dates - now shown. He also says he doubts whether the Wand release ever took place. As I've never seen I'm sure he's right. I'm grateful to him as always. Alan Wheway has kindly confirmed the 1965 date.